When I picked out my coloring book, crayons, and $1 daisy plant, I did some recon work for my other tasks. Build a Lego set. Complete and a frame a 500-piece puzzle. No problem. Finding the Lego aisle was easy but finding a simple and reasonably priced set was difficult. 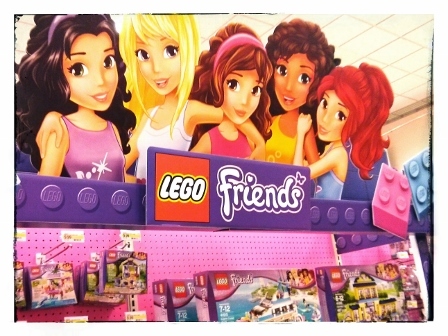 And I’m not sure how I feel about the separate Lego sets for boys and girls. 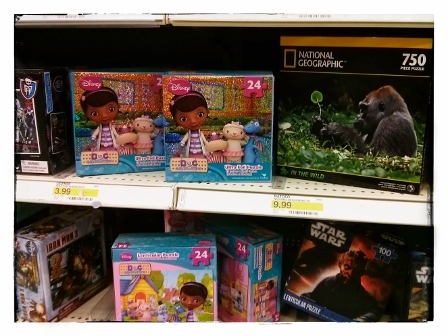 I understand the concept and the reasoning behind it, but I’m not super crazy looking at pink and purple and pastel Lego sets in one aisle. I may not be an expert on cars, but I can appreciate a pretty car or motorcycle not bathed in pastel colors. My indifference was quickly forgotten until I saw the perfect Lego set. CINDERELLA! What?!? As much as I absolutely love Cinderella, I didn’t love the pricetag. 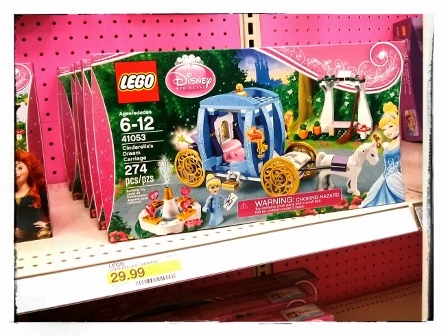 $29.99 for a Cinderella Lego set? Nope. I probably would’ve been tempted had the set been on sale for $14.99. Who am I kidding? I probably would’ve been bought it for $14.99. $19.99 would be temptation. When I couldn’t find a Lego set that I liked and within my price range, I wandered over to the puzzle section. Why can’t I find a wide selection of 500-piece puzzles? A 10o-piece puzzle would be too easy for me, and a 1,000-piece puzzle would test my patience. A 500-piece puzzle seems like a good compromise, but my selection at a certain store was very limited. 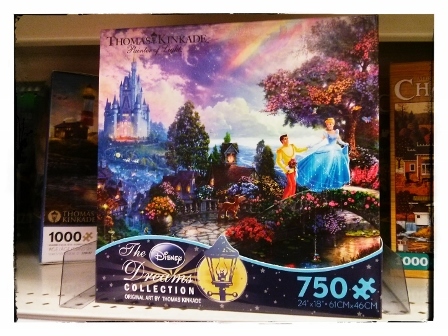 However, I spotted the perfect puzzle for me … hello, Cinderella! I was very very very tempted to spend $9.99 for my personal prize. $9.99 TOO MUCH FOR A 750-PIECE PUZZLE? I was so incredibly close to buying the puzzle until my sensibility kicked in. I should do research. How much does a 500-piece puzzle cost? I’m pretty sure I could find the Cinderella puzzle somewhere online. I just wonder whether $9.99 is a good price. However, I am in love with National Geographic puzzles featuring adorable animals in the wild. Well, I have some time to decide to pick the perfect puzzle and Lego set before completing my 40 before 40 list. PUZZLES WITH 100 PIECES. 750 PIECES. 1000 PIECES. UM, WHERE’S THE PUZZLE WITH 500 PIECES?